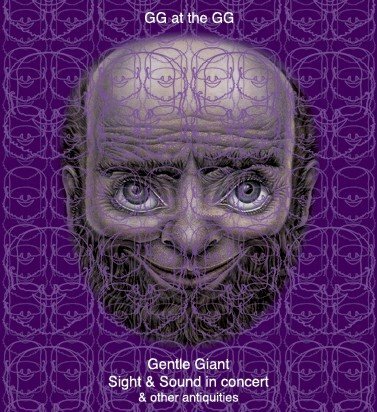 Aunque ya no es mucha novedad, hay que decir que ya se ha publicado el dvd de Gentle Giant "Sight and sound", actuación de 1978 en la BBC. El concierto está dando vueltas por la red desde hace mucho tiempo pero es de suponer que el dvd tendrá mucha mejor calidad, aparte de los extras que lleve. New! The official release of the famous BBC "SIGHT & SOUND" concert from January 1978, at the Golders Green Hippodrome. Audio comes from the BBC Radio 1 Simulcast. There is also a commentary track by Gary, John, Derek, Kerry & Ray! Extras include TV film from "The Old Grey Whistle Test" in 1974, and promo video footage from 1976 and 1978. We've included a bonus audio CD of the concert and "Old Grey Whistle Test." There is also Super 8 footage from April 1975, filmed in Munster, Germany by Martin Buntrock with audio added by Klaus Buntrock. As always, Gary has provided a superb gallery of pics, plus some live shots & memorabilia. Finally, Kerry has composed new music for the intro and menus, with drumming by John "Pugwash" Weathers taken from multitracks provided by our old friend Dan Bornemark. Publicado por demetrio en 3:10 p. m.
Acid mothers gong "Live in Nagoya"
A triggering myth "The remedy of abstraction"